Today marks what would have been Anne Bronte’s 195th birthday. To me, one of the great mysteries in life is the fact that Anne’s novels are not on as many required reading lists as Wuthering Heights or Jane Eyre, and I often find myself wondering why her characters are not discussed as much as Emily’s Heathcliff or Charlotte’s Jane. In my opinion, the youngest Bronte was every bit the writer that her sisters were, and her brilliant novels deserve just as much praise. It’s kind of like how George Harrison always gets overlooked under the shadow of Paul and John. No one’s denying the genius of Paul and John, but George wrote “Here Comes the Sun”, people. “Here Comes the Sun”! 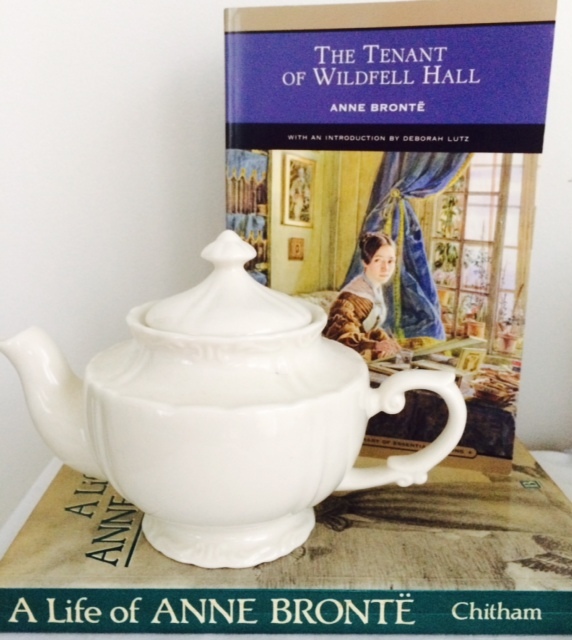 In honor of Anne’s birthday, if you’re looking for a compelling and addictive read, I urge you to pick up a copy of her 1848 novel, The Tenant of Wildfell Hall—a book that was a huge success upon its publication, and a book that is still one of the most important pieces of feminist literature today. The Tenant of Wildfell Hall follows the story of Helen Graham, a fiercely independent woman who flees a horrific marriage and sets up as an artist in order to support herself and her young son. (In the 1840s. Chew on that one for a minute.) While trying to keep her past a secret, she is subjected to the scrutiny of a gossipy small town and the affections of a well-meaning, local farmer. It’s a cautionary tale about marrying the wrong kind of man, a hopeful romance with the right one, and most of all, a testament to the strength of women. In most Victorian literature, the rascals typically fall into two categories: the rakish charmers who our heroines fortunately escape, and the misunderstood Byronic rogues who just need some love. Anne Bronte takes a more realistic approach. With Helen’s husband, Arthur Huntington, Anne strips any notion of romanticism away and shows the dangers of marrying a bad boy—one who certainly does not have a heart of gold buried somewhere underneath and one who cannot be saved by a little TLC. Her message? He may be a smooth talker at a ball, but unless you want to watch him drink himself half to death, corrupt your child and parade floozies under your nose, saying “I do” is probably not the route you want to take. While the book can get decidedly darker at points than a lot of fiction of its time, the overall outlook is actually quite uplifting. Helen can decide her own fate. Yes, she has a small support system willing to help her, and yes, she has the prospect of love with a good guy in her future, but Helen alone must take charge of her own destiny, and Helen alone is the hero of her own story. If you’re looking for a great book you can get sucked into, filled with characters you will never forget—especially if you enjoyed Jane Eyre and Wuthering Heights—you must read The Tenant of Wildfell Hall. If you ask me, this novel should be on just as many required reading lists as the other Bronte sisters’ works, and Anne’s name should be every bit as recognizable as Charlotte’s and Emily’s. Once again, Stephanie, you have made a book which really doesn’t interest me seem interesting and a must read. Your love of books and characters comes through in everything you write. Any author of a book you favor should run to have you review it!